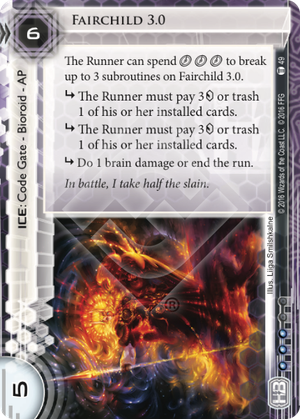 The Runner can spend clickclickclick to break up to 3 subroutines on Fairchild 3.0.
subroutine The Runner must pay 3credit or trash 1 of his or her installed cards. subroutine Do 1 brain damage or end the run. Best Code Gate in the game, hands down. It even beats Tollboth and DNA Tracker, in my opinion. The cost-str is too efficient, and 3 subroutines you cannot ignore too. Yes its triple clickable, but the tax it gives in centrals for just 6 is just crazy.